The diseases are caused by specific types of bacterial infection. Epidemic typhus is due to Rickettsia prowazekii spread by body lice, scrub typhus is due to Orientia tsutsugamushi spread by chiggers, and murine typhus is due to Rickettsia typhi spread by fleas. There is currently no commercially available vaccine. Prevention is by reducing exposure to the organisms that spread the disease. Treatment is with the antibiotic doxycycline. Epidemic typhus generally occurs in outbreaks when poor sanitary conditions and crowding are present. While once common, it is now rare. Scrub typhus occurs in Southeast Asia, Japan, and northern Australia. Murine typhus occurs in tropical and subtropical areas of the world. Typhus has been described since at least 1528 AD. The name comes from the Greek tûphos (τύφος) meaning hazy, describing the state of mind of those infected. While "typhoid" means "typhus-like", typhus and typhoid fever are distinct diseases caused by different types of bacteria. Signs and symptoms begin with sudden onset of fever, and other flu-like symptoms about one to two weeks after being infected. Five to nine days after the symptoms have started, a rash typically begins on the trunk and spreads to the extremities. This rash eventually spreads over most of the body, sparing the face, palms, and soles. Signs of meningoencephalitis begin with the rash and continue into the second or third weeks. Other signs of meningoencephalitis include sensitivity to light (photophobia), altered mental status (delirium), or coma. Untreated cases are often fatal. Rickettsia prowazekii Body louse When the term "typhus" is used without clarification, this is usually the condition described. Historical references to "typhus" are now generally considered to be this condition. As of 2017 there is no commercially available vaccine. A vaccine has been in development for scrub typhus known as the scrub typhus vaccine. The American Public Health Association recommends treatment based upon clinical findings and before culturing confirms the diagnosis. Without treatment, death may occur in 10 to 60 percent of patients with epidemic typhus, with patients over age 60 having the highest risk of death. In the antibiotic era, death is uncommon if doxycycline is given. In one study of 60 hospitalized patients with epidemic typhus, no patient died when given doxycycline or chloramphenicol. Some patients also may need oxygen and intravenous (IV) fluids. According to the World Health Organization, the current death rate from typhus is about one out of every 5,000,000 people per year. Only a few areas of epidemic typhus exist today. Since the late 20th century, cases have been reported in Burundi, Rwanda, Ethiopia, Algeria, and a few areas in South and Central America. Except for two cases, all instances of epidemic typhus in the United States have occurred east of the Mississippi River. An examination of a cluster of cases in Pennsylvania concluded the source of the infection was flying squirrels. Sylvatic cycle (diseases transmitted from wild animals) epidemic typhus remains uncommon in the US. The Centers for Disease Control and Prevention have documented only 47 cases from 1976 to 2010. An outbreak of flea-borne typhus was identified in downtown Los Angeles, California in October 2018 that was larger than their usual number of typhus cases. In historical times "Gaol Fever", or "Aryotitus fever" was common in English prisons, and is believed by modern authorities to have been typhus. It often occurred when prisoners were crowded together into dark, filthy rooms where lice spread easily. Thus "Imprisonment until the next term of court" was often equivalent to a death sentence. Prisoners brought before the court sometimes infected members of the court. Following the assizes held at Oxford in 1577, later deemed the Black Assize, over 300 died from gaol fever, including Sir Robert Bell, Lord Chief Baron of the Exchequer. The Black Assize of Exeter 1586 was another notable outbreak. During the Lent assizes court held at Taunton in 1730, gaol fever caused the death of the Lord Chief Baron, as well as the High Sheriff, the sergeant, and hundreds of others. During a time when persons were executed for capital offenses, more prisoners died from 'gaol fever' than were put to death by all the public executioners in the British realm. In 1759, an English authority estimated that each year a quarter of the prisoners had died from gaol fever. In London, gaol fever frequently broke out among the ill-kept prisoners of Newgate Prison and then moved into the general city population. In May 1750, the Lord Mayor of London, Sir Samuel Pennant, and a large number of court personnel were fatally infected in the courtroom of the Old Bailey, which adjoined Newgate Prison. Epidemics occurred routinely throughout Europe from the 16th to the 19th centuries, including during the English Civil War, the Thirty Years' War, and the Napoleonic Wars. Pestilence of several kinds raged among combatants and civilians in Germany and surrounding lands from 1618 to 1648. According to Joseph Patrick Byrne, "By war's end, typhus may have killed more than 10 percent of the total German population, and disease in general accounted for 90 percent of Europe's casualties." During Napoleon's retreat from Moscow in 1812, more French soldiers died of typhus than were killed by the Russians. A major epidemic occurred in Ireland between 1816 and 1819, during the famine caused by a worldwide reduction in temperature known as the Year Without a Summer. An estimated 100,000 people perished. Typhus appeared again in the late 1830s, and yet another major typhus epidemic occurred during the Great Irish Famine between 1846 and 1849. The Irish typhus spread to England, where it was sometimes called "Irish fever" and was noted for its virulence. It killed people of all social classes, as lice were endemic and inescapable, but it hit particularly hard in the lower or "unwashed" social strata. In the United States, a typhus epidemic broke out in Philadelphia in 1837 and killed the son of Franklin Pierce (14th President of the United States) in Concord, New Hampshire, in 1843. Several epidemics occurred in Baltimore, Memphis and Washington, D.C. between 1865 and 1873. Typhus was also a significant killer during the US Civil War, although typhoid fever was the more prevalent cause of US Civil War "camp fever". Typhoid fever, caused by the bacterium Salmonella typhii (not to be confused with Salmonella enterica, the cause of salmonella food poisoning), is a completely different disease from typhus. In Canada alone, the typhus epidemic of 1847 killed more than 20,000 people from 1847 to 1848, mainly Irish immigrants in fever sheds and other forms of quarantine, who had contracted the disease aboard the crowded coffin ships in fleeing the Great Irish Famine. Officials neither knew how to provide sufficient sanitation under conditions of the time nor understood how the disease spread. The clipper Ticonderoga was infamous for her "fever ship" voyage from Liverpool to Port Phillip carrying 795 passengers in 1852. The overcrowded ship was not designed well for passenger carrying, sanitary provisions were inadequate, and the ship's doctors were soon overwhelmed. During the voyage, 100 passengers died of what was later determined to have been typhus. Delousing stations were established for troops on the Western Front during World War I, but the disease ravaged the armies of the Eastern Front, with over 150,000 dying in Yugoslavia alone. Fatalities were generally between 10 and 40 percent of those infected, and the disease was a major cause of death for those nursing the sick. In 1922, the typhus epidemic reached its peak in Soviet territory, with some 25 to 30 million cases in Russia. Although typhus had ravaged Poland with some 4 million cases reported, efforts to stem the spread of disease in that country had largely succeeded by 1921 through the efforts of public health pioneers such as Hélène Sparrow and Rudolf Weigl. In Russia, during the civil war between the White and Red Armies, typhus killed 3 million people, mainly civilians. During World War II, many German POWs after the loss at Stalingrad died of typhus. Typhus epidemics killed those confined to POW camps, ghettos, and Nazi concentration camps who were held in unhygienic conditions. Pictures of mass graves including people who died from typhus can be seen in footage shot at Bergen-Belsen concentration camp. Among thousands of prisoners in concentration camps such as Theresienstadt and Bergen-Belsen who died of typhus were Anne Frank, age 15, and her sister Margot, age 19. Major epidemics in the post-war chaos of Europe were averted only by widespread use of the newly discovered DDT to kill the lice on millions of refugees and displaced persons. The first typhus vaccine was developed by the Polish zoologist Rudolf Weigl in the interwar period. Better, less-dangerous and less-expensive vaccines were developed during World War II. Since then, some epidemics have occurred in Asia, Eastern Europe, the Middle East, and parts of Africa. Charles Nicolle received the 1928 Nobel Prize in Medicine for his identification of lice as the transmitter of epidemic typhus. A US soldier is demonstrating DDT hand-spraying equipment. DDT was used to control the spread of typhus-carrying lice. Civilian Public Service worker distributes rat poison for typhus control in Gulfport, Mississippi, c. 1945. Beginning in 2018, a typhus outbreak of more than the usual number of cases has spread through Los Angeles County primarily affecting homeless people. In 2019 city attorney Elizabeth Greenwood revealed that she too was infected with typhus as a result of a flea bite at her office in Los Angeles City Hall which resulted in her going on medical leave. ^ a b c d e f "Typhus Fevers". www.cdc.gov. 7 March 2017. Archived from the original on 26 March 2017. Retrieved 26 March 2017. ^ a b c d "Information for Health Care Providers". www.cdc.gov. 7 March 2017. Archived from the original on 27 March 2017. Retrieved 26 March 2017. ^ a b c d e "Epidemic Typhus". www.cdc.gov. 7 March 2017. Archived from the original on 26 March 2017. Retrieved 27 March 2017. ^ a b c d "Scrub Typhus". www.cdc.gov. 7 March 2017. Archived from the original on 26 March 2017. Retrieved 26 March 2017. ^ a b c d "Murine Typhus". www.cdc.gov. Archived from the original on 26 March 2017. Retrieved 26 March 2017. ^ "WHO | Typhus". www.who.int. May 1997. Archived from the original on 27 March 2017. Retrieved 26 March 2017. ^ a b Bennett, John E.; Dolin, Raphael; Blaser, Martin J. (2014). Mandell, Douglas, and Bennett's Principles and Practice of Infectious Diseases E-Book. Elsevier Health Sciences. p. 2217. ISBN 9780323263733. Archived from the original on 2017-09-10. ^ Evans, Alfred S.; Brachman, Philip S. (2013). Bacterial Infections of Humans: Epidemiology and Control. Springer. p. 839. ISBN 9781461553274. Archived from the original on 2017-09-10. ^ Levinson, Warren (2010). Review of Medical Microbiology and Immunology (11 ed.). McGraw Hill. ISBN 9780071700283. ^ Gary R. Mullen; Lance A. Durden (27 September 2002). Medical and Veterinary Entomology. Academic Press. pp. 58–. ISBN 978-0-08-053607-1. Archived from the original on 10 September 2017. ^ Eremeeva, Marina E; Gregory A Dasch. "Rickettsial (Spotted & Typhus Fevers) & Related Infections (Anaplasmosis & Ehrlichiosis)". CDC Centers for Disease Control and Prevention. Archived from the original on 17 May 2014. Retrieved 15 May 2014. ^ Chattopadhyay, S; Richards, AL (2007). "Scrub typhus vaccines: past history and recent developments". Human Vaccines. 3 (3): 73–80. doi:10.4161/hv.3.3.4009. PMID 17375000. ^ Heymann, David (2015). Control of communicable diseases manual : an official report of the American Public Health Association. Washington, DC: APHA Press, an imprint of the American Public Health Association. pp. 661–668. ISBN 9780875530185. ^ Raoult, D (1997). 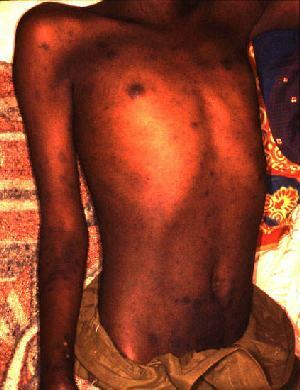 "Jail fever (epidemic typhus) outbreak in Burundi". Emerg Infect Dis. 3 (3): 357–60. doi:10.3201/eid0303.970313. PMC 2627627. PMID 9284381. ^ Mokrani (2004). "Reemerging threat of epidemic typhus in Algeria". J Clin Microbiol. 42 (8): 3898–900. doi:10.1128/jcm.42.8.3898-3900.2004. PMC 497610. PMID 15297561. ^ "Epidemic typhus risk in Rwandan refugee camps". Wkly Epidemiol Rec. 69 (34): 259. 1994. PMID 7947074. ^ Perine, PL (1992). "A clinico-epidemiological study of epidemic typhus in Africa". Clin Infect Dis. 14 (5): 1149–58. doi:10.1093/clinids/14.5.1149. PMID 1600020. ^ Chapman, A (2009). "Cluster of sylvatic epidemic typhus cases associated with flying squirrels, 2004–2006". Emerg Infect Dis. 15 (7): 1005–11. doi:10.3201/eid1507.081305. PMC 2744229. PMID 19624912. ^ McQuiston, JH (2010). "Brill-Zinsser disease in a patient following infection with sylvatic epidemic typhus associated with flying squirrels". Clin Infect Dis. 51 (6): 712–5. doi:10.1086/655891. PMID 20687836. ^ CBS Los Angeles: "Downtown LA Hit With Outbreak Of Flea-Borne Typhus," https://losangeles.cbslocal.com/2018/10/04/downtown-la-skid-row-typhus-outbreak/, October 4, 2018. ^ Zinsser, Hans (1960). Rats, Lice and History. Bantam Classic. p. 186. ^ Byrne, Joseph Patrick (2008). Encyclopedia of Pestilence, Pandemics, and Plagues: A—M. ABC-CLIO. p. 732. ISBN 978-0-313-34102-1. Archived from the original on 2014-01-04. ^ The Historical Impact of Epidemic Typhus Archived 2009-11-14 at WebCite. Joseph M. Conlon. ^ "M993X.5.1529.1 | The government inspector's office". McCord Museum. Montreal. Archived from the original on 8 April 2011. Retrieved 22 January 2012. ^ Paul Weindling. International Health Organisations and Movements, 1918–1939. Cambridge University Press 1995, p. 99. ^ a b "Trials of War Criminals Before the Nurenberg Military Tribunal" (PDF). Volumn 1. US. Government Printing Office. 1949. pp. 508–511. Archived (PDF) from the original on 4 March 2016. Retrieved 19 May 2015. ^ Grover, Joel; Corral, Amy. "Typhus Epidemic Worsens in Los Angeles". NBC Southern California. Retrieved 9 February 2019. ^ Smith, Dakota. "L.A. City Hall, overrun with rats, might remove all carpets amid typhus fears". latimes.com. ^ Service, City News. "Amid Typhus Outbreak, LA City Hall Carpets May Be Ripped Out". NBC Southern California. Retrieved 12 February 2019. Bolivian hemorrhagic fever (BHF), also known as black typhus or Ordog Fever, is a hemorrhagic fever and zoonotic infectious disease originating in Bolivia after infection by Machupo mammarenavirus.BHF was first identified in 1963 as an ambisense RNA virus of the Arenaviridae family, by a research group led by Karl Johnson. The mortality rate is estimated at 5 to 30 percent. Due to its pathogenicity, Machupo virus requires Biosafety Level Four conditions, the highest level.During the period between February and March 2007, some 20 suspected BHF cases (3 fatal) were reported to the El Servicio Departamental de Salud (SEDES) in Beni Department, Bolivia. In February 2008, at least 200 suspected new cases (12 fatal) were reported to SEDES. In November 2011, a second case was confirmed near the departmental capital of Trinidad, and a serosurvey was conducted to determine the extent of Machupo virus infections in the Department. A SEDES expert involved in the survey expressed his concerns about the expansion of the virus to other provinces outside the endemic regions of Mamoré and Iténez provinces. Boutonneuse fever (also called Mediterranean spotted fever, fièvre boutonneuse, Kenya tick typhus, Indian tick typhus, Marseilles fever, or African tick-bite fever, or Astrakhan Fever) is a fever as a result of a rickettsial infection caused by the bacterium Rickettsia conorii and transmitted by the dog tick Rhipicephalus sanguineus. Boutonneuse fever can be seen in many places around the world, although it is endemic in countries surrounding the Mediterranean Sea. This disease was first described in Tunisia in 1910 by Conor and Bruch and was named boutonneuse (French for "spotty") due to its papular skin rash characteristics. Epidemic typhus is a form of typhus so named because the disease often causes epidemics following wars and natural disasters. The causative organism is Rickettsia prowazekii, transmitted by the human body louse (Pediculus humanus corporis). Flying squirrel typhus is a condition characterized by a rash of early macules, and, later, maculopapules.The flying squirrel Glaucomys volans can transmit epidemic typhus.Apart from humans, flying squirrels are the only currently known reservoir for Rickettsia prowazekii. Murine typhus (also called endemic typhus) is a form of typhus transmitted by fleas (Xenopsylla cheopis), usually on rats. (This is in contrast to epidemic typhus, which is usually transmitted by lice.) Murine typhus is an under-recognized entity, as it is often confused with viral illnesses. Most people who are infected do not realize that they have been bitten by fleas. North Asian tick typhus (or North Asian tick fever), also known as Siberian tick typhus, is a condition characterized by a maculopapular rash.It is associated with Rickettsia sibirica. Queensland tick typhus (or Australian tick typhus or (Rickettsial) spotted fever) is a condition caused by a bacterium Rickettsia australis.It is transmitted by Ixodes holocyclus and Ixodes tasmani. Properly, Rickettsia is the name of a single genus, but the informal term "rickettsia", plural "rickettsias", usually non-capitalised, commonly applies to any members of the order Rickettsiales. Being obligate intracellular parasites, rickettsias depend on entry, growth, and replication within the cytoplasm of living eukaryotic host cells (typically endothelial cells). Accordingly Rickettsia species cannot grow in artificial nutrient culture; they must be grown either in tissue or embryo cultures; typically, chicken embryos are used, following a method developed by Ernest William Goodpasture and his colleagues at Vanderbilt University in the early 1930s. Rickettsia species are transmitted by numerous types of arthropod, including chigger, ticks, fleas, and lice, and are associated with both human and plant disease. Most notably, Rickettsia species are the pathogens responsible for typhus, rickettsialpox, Boutonneuse fever, African tick bite fever, Rocky Mountain spotted fever, Flinders Island spotted fever and Queensland tick typhus (Australian tick typhus). The majority of Rickettsia bacteria are susceptible to antibiotics of the tetracycline group. Rickettsia conorii is a Gram-negative, obligate intracellular bacterium of the genus Rickettsia that causes human disease called Boutonneuse fever, Mediterranean spotted fever, Israeli tick typhus, Astrakhan spotted fever, Kenya tick typhus, Indian tick typhus, or other names that designate the locality of occurrence while having distinct clinical features. It is a member of the spotted fever group and the most geographically dispersed species in the group, recognized in most of the regions bordering on the Mediterranean Sea and Black Sea, Israel, Kenya, and other parts of North, Central, and South Africa, and India. The prevailing vector is the brown dog tick, Rhipicephalus sanguineus. The bacterium was isolated by Emile Brumpt in 1932 and named after A. Conor who, in collaboration with A. Bruch, provided the first description of boutonneuse fever in Tunisia in 1910.The genome of the bacterium has been sequenced and four subspecies have been identified. Rickettsia typhi is a species of infectious bacterium of the genus Rickettsia; it is the causative agent of Murine typhus.The genome is similar to that of Rickettsia prowazekii. Scrub typhus or bush typhus is a form of typhus caused by the intracellular parasite Orientia tsutsugamushi, a Gram-negative α-proteobacterium of family Rickettsiaceae first isolated and identified in 1930 in Japan.Although the disease is similar in presentation to other forms of typhus, its pathogen is no longer included in genus Rickettsia with the typhus bacteria proper, but in Orientia. The disease is thus frequently classified separately from the other typhi. Typhoid fever, also known simply as typhoid, is a bacterial infection due to specific type of Salmonella that causes symptoms. Symptoms may vary from mild to severe and usually begin six to thirty days after exposure. Often there is a gradual onset of a high fever over several days. This is commonly accompanied by weakness, abdominal pain, constipation, headaches, and mild vomiting. Some people develop a skin rash with rose colored spots. In severe cases people may experience confusion. Without treatment, symptoms may last weeks or months. Diarrhea is uncommon. Other people may carry the bacterium without being affected; however, they are still able to spread the disease to others. Typhoid fever is a type of enteric fever, along with paratyphoid fever.The cause is the bacterium Salmonella enterica subsp. enterica growing in the intestines and blood. Typhoid is spread by eating or drinking food or water contaminated with the feces of an infected person. Risk factors include poor sanitation and poor hygiene. Those who travel in the developing world are also at risk. Only humans can be infected. Symptoms are similar to those of many other infectious diseases. Diagnosis is by either culturing the bacteria or detecting the bacterium's DNA in the blood, stool, or bone marrow. Culturing the bacterium can be difficult. Bone marrow testing is the most accurate.A typhoid vaccine can prevent about 40% to 90% of cases during the first two years. The vaccine may have some effect for up to seven years. It is recommended for those at high risk or people traveling to areas where the disease is common. Other efforts to prevent the disease include providing clean drinking water, good sanitation, and handwashing. Until it has been confirmed that an individual's infection is cleared, the individual should not prepare food for others. The disease is treated with antibiotics such as azithromycin, fluoroquinolones or third generation cephalosporins. Resistance to these antibiotics has been developing, which has made treatment of the disease more difficult.In 2015, there were 12.5 million new cases worldwide. The disease is most common in India. Children are most commonly affected. Rates of disease decreased in the developed world in the 1940s as a result of improved sanitation and use of antibiotics to treat the disease. Each year in the United States, about 400 cases are reported and it is estimated that the disease occurs in about 6,000 people. In 2015, it resulted in about 149,000 deaths worldwide – down from 181,000 in 1990 (about 0.3% of the global total). The risk of death may be as high as 20% without treatment. With treatment, it is between 1 and 4%. Typhus is a different disease. However, the name typhoid means "resembling typhus" due to the similarity in symptoms. Typhus vaccines are vaccines developed to protect against typhus. As of 2017 they are not commercially available.One typhus vaccine consists of formaldehyde-inactivated Rickettsia prowazekii. Two doses are injected subcutaneously four weeks apart. Booster doses are required every six to twelve months.